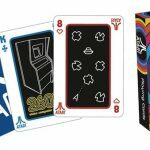 Play Atari anywhere you want with a deck of Atari Playing Cards. Pew pew. Features officially licensed 8 bit playing cards with Asteroids, Breakout, Centipede and Millipede on them. Official poker size with a linen finish. They might work better if you blow on the box.